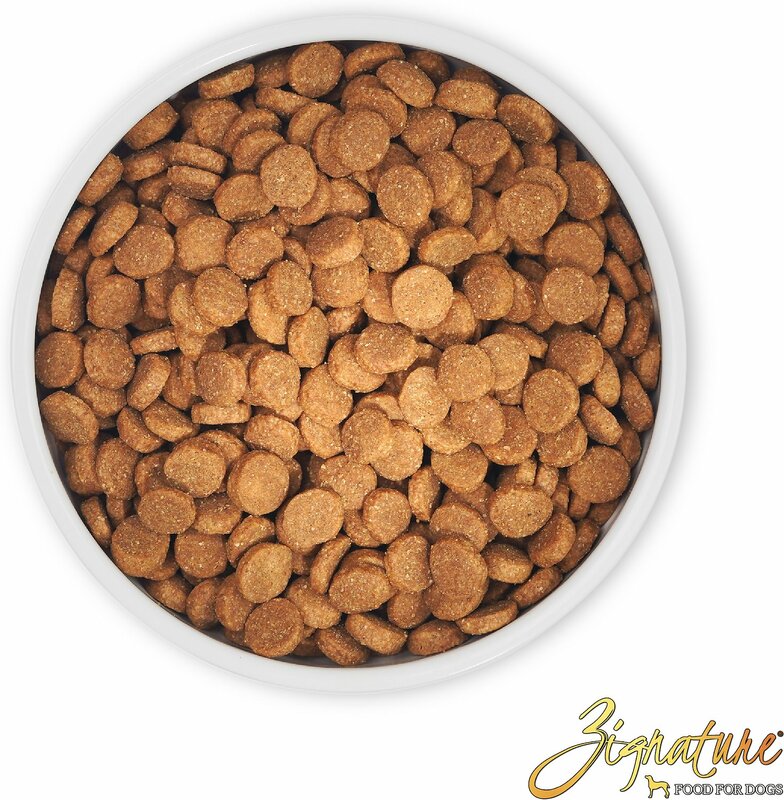 Fill your best friend’s bowl with wholesome nutrition when you feed them Zignature Pork Limited Ingredient Formula Grain-Free Dry Dog Food. Your pup will enjoy a delicious dinner made with real, farm-raised Pork, wholesome peas, chickpeas, and flaxseed. This meat-first recipe offers pups the protein they need to thrive, while Zignature’s limited ingredient recipe throws out troublesome ingredients like chicken, corn, wheat, soy, and potatoes, creating peak hypoallergenic, low-glycemic nutrition. Combine that with key antioxidants, essential fatty acids, and a complete spectrum of vitamins and minerals for a well-rounded meal that goes beyond nature to become your pet’s signature food for life. Made from sustainably-sourced US Pork, which is a rich dietary source of protein, containing a healthy amino acid profile. A gradual transition to Zignature for up to 2 weeks is recommended. My one year old mix breed loves this food! He is extremely picky about flavors, and though he loves it, he can’t have beef since he breaks out in hives. We are loving that Chewy is carrying Zignature so we can try new flavors and not worry about transitioning between foods. Zignature is by far the best dog food on the market today. 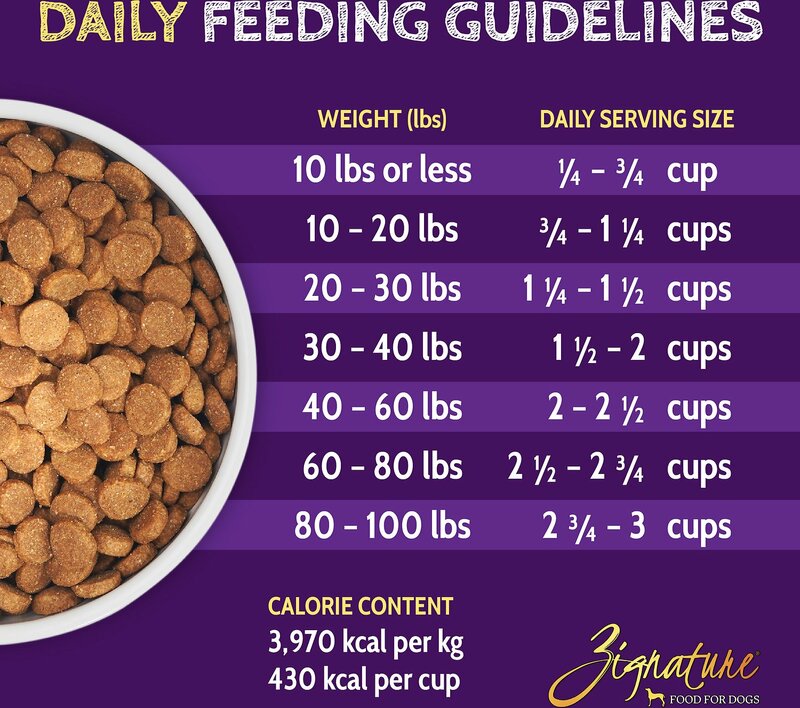 Your dog isn't stuck with the same food day after day. Zignature has in excess 10 different flavors and nothing but the best ingredients. It's not full of fillers as so many on the market today. try it you and your best friend will love it. my dog really likes it but..
She loves this food, and she is picky, but she poops so much a day and she only eats 2.5 cups. I'm talking like 5 or 6 big huge cow piles and she's definitely used to the food and has been on it for a few months now, and her poops are just terrible smelling, average looking, and MASSIVE and so so so many times a day. This food doesn't really have any fillers and is quality and her coat and energy levels are awesome, but her poops need to chill... I'm switching to a new food. 2.5 cups a day should not equal 6 massive cow piles from an 80 pound dog. 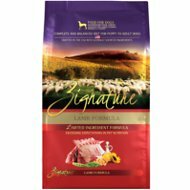 My dogs love the Zignature brand and I love that there are so many options when it comes to variety so if they get tired of one flavor we can try another. Right now they are on a mix of turkey and pork. I have a Goldendoodle who thinks she is a human. She absolutely turns her nose up at all dog food and I have to mix it with something delish. I decided to buy 4lb. 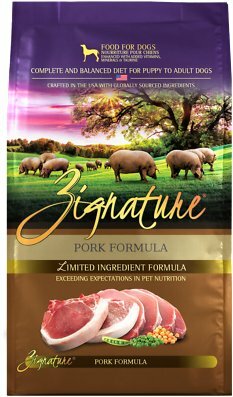 bags of dog food for sampling (I have a Malamute that will eat anything so we have no waste) and then I found Zignature Pork. When I opened this jewel up and she started eating like nobody's business, I was elated. Finally! No more toppers...no more bacon grease....just awesome dog food which happens to be, I think, one of the best around! Thank you, Zignature! I use a variety of flavors of Zignature Limited Ingredient Grain-Free Dry Dog Food. I switch between flavors: Pork, Duck, Salmon and Kangaroo. My dogs do well with all these flavors and transition between flavors without digestive upset. I've got two pit bulls. One needs grain-free to prevent excessive gas, and he does well with Zignature Grain Free dry dog food. My other dog needs a limited ingredient formula because she appears to have food allergies that present as severe itchiness. She's been fairly itch-free since switching to the limited ingredient formula, although I'm waiting for springtime to determine if it is the food or winter that's cured her of her itchiness. The dogs love the taste of this food. The ingredients are good without any of the things you don't want to see in your pet's food. My dogs transitioned to this food very easily. With the recent hype about grain free kibble, I've been looking for an brand that is highly rated with quality ingredients. Zignature checks all my boxes. One of my dogs is allergic to chicken. This pork formula is great. The dogs love it! If I could I would feed raw. Because that is simply too expensive, I feed this and canned food, mixed. My dog has pretty bad allergies and gets super itchy with most kibble. Zignature kibbles aren’t a problem, though.